Old Notes are an emo trio originating from California whose new album With A Heavy Heart is a follow up to their 2016 EP, Former Self. The new album is very emotive and discusses life struggles such as loss, abusive relationships and suicide through the lyrics. The instrumentation is very atmospheric and consistent throughout the album, suggesting the trio have discovered their sound. The album begins with Condolence, a short introduction at under a minute in length. This synth opening establishes a sound that will recur through two other short interludes interspersed across the album. The second interlude is the fifth track on the album, Consolation, and the third interlude is track nine, Relief. The titles of these tracks imply a transition of emotions following a difficult time. The music also represents this for the synth sound evolves across each track, and the instrumentation becomes gradually fuller. This side narrative included amongst the other tracks of the album presents the band’s creativity and the depth of detail they want their work to reach. The significance of the lyrics and accompanying atmosphere shows the band’s identity is already well formed with an established direction of where they want to take their sound. The instrumentation is well written and executed on each track. All of the tracks are well mixed with no dominating of a particular instrument or vocals. The guitar tones revolve around variations of clean and reverb which adds to the synth sounds used in the established atmosphere of the album. Track three, Reach, opens with scalic melodies in the lead guitar. The addition of percussion and clean lyrics create a fuller sound without overtaking the guitar melody. The transition to chords for the chorus increases the heaviness of the track slightly, which suits the vocalists change to more aggressive lyrics from clean. The harsher screams in this track and in others across the album create a contrast which does not always fit perfectly. Sections of Relief and track two, Solace, do not feel heavy enough for the screams, and at times the screams do sound slightly strained. However, for the most part, the vocals are well utilised for conveying the dark, difficult themes of the album. Dead Flowers, the eighth track on the album conveys small elements of jazz and blues influences. The chord progression and melodic guitar licks in the opening of this track, along with sections of short staccato chords introduce sounds of these genres. These small details further display the band’s attention to detail and talents with song writing. Despite not being the established genre of the band, this track does not feel out of the place on the album, it merely adds some extra variety but in their own style. Despite being new to the music scene, Old Notes are growing incredibly quickly are as a band. The high quality of their new album in both song writing and execution through the recording shows they have great potential. 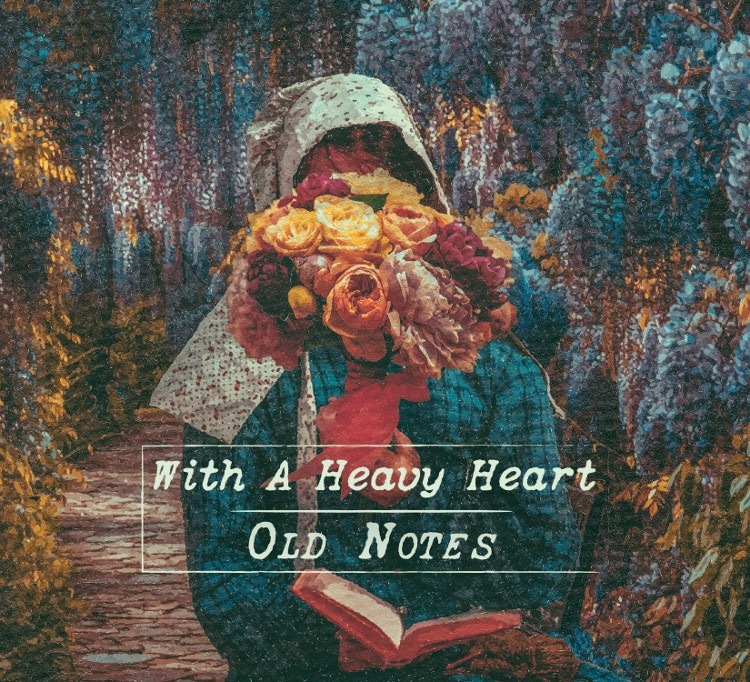 ‘With A Heavy Heart’ by Old Notes is out now on Old Press Records.